EDMONTON, ALBERTA, August 2013– Cyclists, supporters, family and friends will ride in solidarity to show support for Ride the Trail for Elizabeth, a cross country campaign to raise awareness and promote the completion of a Trans-Canada Trail that will be accessible and safe for cyclists. Elizabeth Ann Slovis got on her first bike at the age of 50 and immediately fell in love. An avid outdoor enthusiast, Elizabeth, alongside her husband Edmund A. Aunger, would spend their summers cycling the Trail. Though the Trans-Canada Trail was not always smooth or safe, Edmund recalls Elizabeth’s passion for the Trail she loved, “she wanted to devote her retirement to getting the Trail properly developed and completed - ensuring accessibility and safety for all cyclists”. 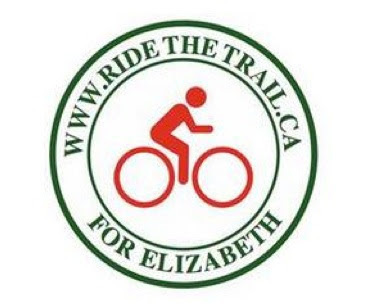 On July 14th, 2012 while Edmund and Elizabeth were biking along the Trail in Prince Edward Island, Elizabeth was struck and killed by a drunk driver. She was 63. Survived by her husband and her three sons, Edmund S. Aunger, Richard Aunger and Gregory Aunger,Elizabeth’s dream of a safer Trans-Canada Trail lives on. Edmund Aunger has carried on his beloved wife’s vision and started the Ride the Trail for Elizabeth campaign. A campaign that will see Edmund cycle across the country in five stages each summer, beginning the first leg of his journey on July 1st, 2013 in Victoria, British Columbia and finishing in Charlottetown, Prince Edward Island on July 2017. Edmund will be arriving in Edmonton on Sunday August 25, 2013 marking the completion of his first leg. We invite you to join Edmund on the steps of the Alberta Legislature on Sunday afternoon at 3:00pm as we rally in support for a safer Trans-Canada Trail. More importantly, we invite you to celebrate the completion of Edmund’s first leg, the power of a united cycling community and the realization of Elizabeth’s dream. We hope to see you there. Ride on. Please join Ed on his ride. He will be leaving Devon around 9am, cycling on Highway 19, and then into Edmonton, Trans Canada Trail from Terwilliger to Hawrelak Park. He will be leaving the Hawrelak Park pedestrian bridge about 2pm and continuing to the Alberta Legislature for a 3pm rally, followed by a ride to the Trans-Canada Trail head in Louise McKinney Park.